Wednesday, October 31 at 8:45 PM at the State as an early Halloween Screening! Opens Friday, November 2 for a full run at the State. Remake of the cult classic Italian horror film. A darkness swirls at the center of a world-renowned dance company, one that will engulf the troupe's artistic director (TILDA SWINTON), an ambitious young dancer (DAKOTA JOHNSON), and a grieving psychotherapist (LUTZ EBERSDORF). Some will succumb to the nightmare. Others will finally wake up. 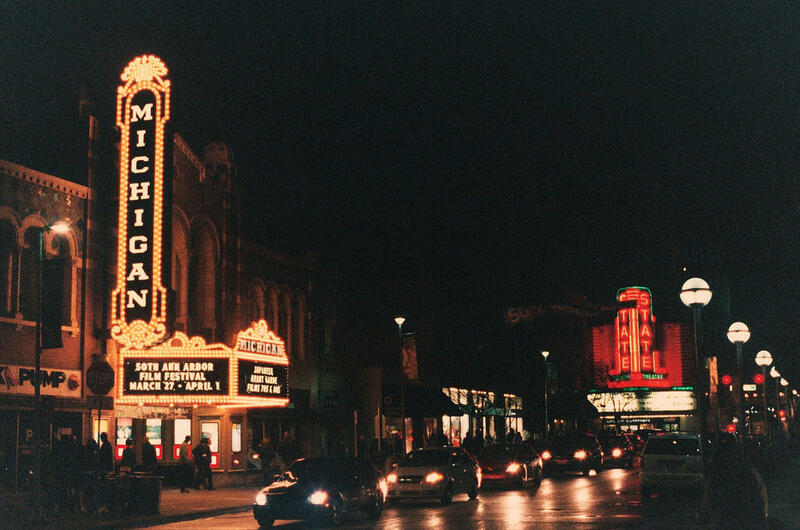 At the Michigan: In this film, viewers are invited to see happens when four legends of British stage and screen get together. Dame Maggie Smith, Dame Judi Dench, Dame Eileen Atkins, and Dame Joan Plowright are among the most celebrated actresses of our time, with scores of iconic performances, decades of wisdom, and innumerable Oscars, Tonys, Emmys, and BAFTAs between them. They are also longtime friends who hereby invite you to join them for a weekend in the country as they catch up with one another, reminisce, and share their candid, delightfully irreverent thoughts on everything from art to aging to love to a life lived in the spotlight. At the Michigan: Based on a true story, this film stars Melissa McCarthy as Lee Israel, the best-selling celebrity biographer who made her living in the 1970's and 80's profiling the likes of Katharine Hepburn, Tallulah Bankhead, Estée Lauder, and journalist Dorothy Kilgallen. When Lee found herself unable to get published because she had fallen out of step with the marketplace, she turned her art form to deception, abetted by her loyal friend Jack (played by Richard E. Grant). This film is part of a double feature that will play Sunday, October 28 at 4:00 PM at the State as a part of the “Electric Shadows” film series presented by the Confucius Institute at U-M. Free and open to the public! This is a short film of interviews, a few women talking about how they remember their previous relationships. These immensely personal and feminine narratives were brought into an insulated interior space, interweaved with each other to form a fictional time and space. This film is part of a double feature that will play Sunday, October 28 at 4:00 PM at the State as a part of the “Electric Shadows” film series presented by the Confucius Institute at U-M. Free and open to the public! This is a work about “creating” miracles in our everyday life. Ruohan, Lily and Zoe are close friends. They are spending their summer vacation together in the southern city of Guangzhou, China. They document their vacation time with their cell phones while they discover they have super-powers. This plays October 28 at 7:00 PM at the Michigan! An encore presentation of a performance originally broadcast live from the National Theatre in London. Presented in partnership with UMS. Directed by Academy Award-winner Danny Boyle ("Trainspotting," "Slumdog Millionaire"), it features Benedict Cumberbatch (BBC’s "Sherlock") and Jonny Lee Miller ("Trainspotting"). Childlike in his innocence but grotesque in form, Frankenstein’s bewildered creature is cast out into a hostile universe by his horror-struck maker. Meeting with cruelty wherever he goes, the increasingly desperate and vengeful Creature determines to track down his creator and strike a terrifying deal. Tickets available at UMS.org. This film plays Wednesday, October 31 at 7:00 PM at the Michigan as a part of the Polish History in Film Masterpieces Film Series presented by the Polish Cultural Fund. Free and open to the public! In repressive mid-1970s Poland, documentary filmmaker Agnieszka (Krystyna Janda) begins work on a film about Mateusz Birkut (Jerzy Radziwilowicz), a bricklayer who had briefly been hailed as a hero of the proletariat in the 1950s, but then disappeared into obscurity. In piecing together details about the bricklayer’s mysterious life, she discovers that his involvement in organized labor had been viewed negatively by party bosses, and that her own investigations could put her in danger. Originally released in 1977. Directed by Andrzej Wajda. Deep under the Arctic Ocean, American submarine Captain Joe Glass (Gerard Butler, "Olympus Has Fallen," "300") is on the hunt for a U.S. sub in distress when he discovers a secret Russian coup is in the offing, threatening to dismantle the world order. Captain Glass must now assemble an elite group of Navy SEALs to rescue the kidnapped Russian president and sneak through enemy waters to stop WWIII. Director: Donovan Marsh. Writers: Arne Schmidt, Jamie Moss. Also stars Gary Oldman and Common. The extraordinary true story of Army Chaplain Darren Turner and his wife Heather. When war etches battle scars on their hearts, they face one more battle: the fight to save their marriage. One marriage, one family, under God. Director: David G. Evans. Writers: David G. Evans, Cheryl McKay. Stars: Justin Bruening, Sarah Drew, Jason George. Clairvoyant femme fatale Nicola Six has been living with a dark premonition of her impending death by murder. She begins a tangled love affair with three uniquely different men: one of whom she knows will be her murderer. Director: Mathew Cullen. Writers: Martin Amis (novel), Roberta Hanley. Stars: Amber Heard, Cara Delevingne, Gemma Chan, Billy Bob Thornton.